It’s Tuesday again, and time for another loss mom interview. 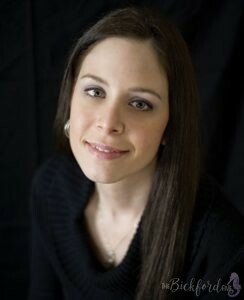 Today, we’re interviewing author Jennifer Ross. I’m so glad I connected with her because like me, she’s writing her story down for the world to read – her book is now available for pre-order on Amazon! You can connect with her on facebook or twitter – and be sure to check out her book too! Many women have had more than one loss. Tell us about the loss that impacted you the most. In January of 2008, I suffered an early miscarriage before I became pregnant with my son, Isaiah. I was already the mother to 3 boys at the time, and after the loss I was a complete mess. I remember going to bed at night and tears running over my pillow as I tried to go to sleep. I would ponder who the child would have been. Was the baby a little boy, or a girl this time. As a mother, I knew what I had lost. It wasn’t just a precious life that I lost, but my dreams of mothering this child as well. As days and weeks passed, I slowly accepted my loss and trusted God in His perfect will. In March of 2008, my husband and I were expecting again. This time I was extremely nervous after experiencing an early miscarriage only weeks prior. Within days of making my 8 week appointment, I called and asked if I could come in sooner. They completely understood and had me come in at 5 weeks. When I was checked by ultrasound at that 5 week appointment, the doctor found a bleed in my uterus, directly above the placenta … This was NOT good news! I continued to bleed from week 5 all the way through to 19 weeks and 3 days. The bleed had created a blood clot that grew atop my placenta. I was rushed by ambulance on the night of August 2, 2008. The blood clot had torn from the placenta earlier the following morning. In the late morning of August 3, 2008, I was told that I had a condition called Disseminated Intravascular Coagulation. Due to the continued bleeding from the placenta, my body was beginning to clot the blood throughout my body. My doctor told me that they needed to get the placenta out immediately. My son was going to loose his life … so mine could be saved. Those words still flood my eyes with tears. I have never experienced no greater pain in my life. If I had to tell about the loss that impacted me the most, it would undoubtedly be the loss of Isaiah. Though I could not control what was happening to my body, I still felt like it was a piece of me that failed him. My body was to keep my son alive, and that it couldn’t do. I struggled with a wrenching guilt that would daily pierce my thoughts, and something I still struggle with 5 years later. What did others do or say that helped and/or hurt you during or after your loss? *God doesn’t give you more than you can handle. *At least you have other healthy living children.Yes, these statements are correct, but absolutely heartless comments to speak to a parent that just suffered the loss of a child, especially if you have never experienced a loss, because if you have, I can guarantee that those words would never exit your mouth. A loving hug and listening ear can be a priceless gift to offer a bereaved parent. How does God, religion, or faith play into your loss and how you cope? God has been my absolute *ALL* throughout these last 5 years. The special thing with God … I don’t need to explain one ounce of my pain. He already knows. He knows my thoughts, the pain that consumed my soul for years and watched each tear fill my eyes, as they ran down my cheeks. Whether I am standing at the grave of my son, laying awake at night staring at the blue numbers on the clock, or smiling as I watch my other boys playing-wondering what Isaiah would have been like, God is ALWAYS there. I am truly never alone. I like to think that there is a small piece of Isaiah with me all of the time. If God is always with me, and Isaiah is with God, then we are still together. Not physically, but through the greatest thing one can carry-love. Have you done anything special to remember your loss or to help you move forward after your loss? I have done a couple of things to help carry on the memory of my son. I got a tattoo covering the top of my back 2 years after his death. It is a rainbow, his name, date of birth/death, and his very footprints that the hospital gave me. I have a sunshine on my back too. I got that years before my loss. I had the rainbow put right next to the sun. The sun is colored in the many different colors of the rainbow. 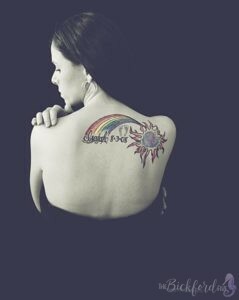 The rainbow has been very significant to me throughout my loss. Three rainbows were viewed the morning after Isaiah died, all within 30 minutes. My tattoo is perfect… to me. 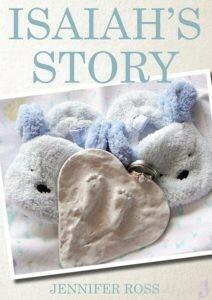 I also wrote a book, Isaiah’s Story, to give life to the life that my son didn’t get to experience here on earth. I wanted to give a bereaved mother/father a safe place to go with there pain, and to know that someone else has walked the same path that they travel. There are women out in the world that have suffered the same kind of traumatic birth as I have endured. It was very difficult for me to talk about in the early years of loss, but as I have shared openly, I have grown comfortable in “putting it all out there.” I have been told that I wear my heart on my sleeve. It’s my prayer that in doing that, others find comfort through my words. I’ll be the voice for those who just can’t get the words out. Lastly, I wanted to give God glory through my pain. Until I enter heaven, I will never know why my son died, but until then, I will fully trust God. He never wastes one single pain in this world. If you could go back and not have had the loss you mentioned in number 1, would you? Why or why not? If I could go back and change the loss of Isaiah, I honestly don’t know what I would choose. That sentence may seem cruel for a mother to write, but I am not the author and finisher of life. God has a plan for my life, just as He had a perfect plan for the life of my son. In the first months after loss, I would find myself endlessly wondering why, but I am now at a place in my life where I have found acceptance with the missing of that little boy within my home. His home is heaven, along with a special seat I have made in my heart for him. As I look back throughout these last 5 years, I have seen God use Isaiah’s life in many beautiful ways, and it’s my hope that as the years continue on, God’s perfect plan will slowly be revealed. When I have joined my son in heaven, I know that all will be shown in full. How could I ever tell God that He made the wrong choices in my life … My life is His. What advice would you give to women that are dealing with the loss of a child? The advice that I would give to women that are dealing with the loss of a child … Take it all in. Feel every ounce of pain that fills your heart and soul. Cry. Cry. Cry … and cry some more. This is all part of the healing and finding the “new” you. Never again will you be the same. Do not rush the process of grief. Find other women who understand what loss is, because it is something very large, and cannot be fought. Absorb the very essence of what grief truly is, and you will come out stronger than you never new was possible. They say time heals. It’s not the “time” that heals the pain, it’s what you do with that pain during that time. My plans for the future are quite simple. I take the time to pause, and take it all in. The beauty that surrounds us is absolutely amazing. I now can find beauty in the weeds that fill a ditch along the road, a thunderstorm that darkens the sky and even a dandelion that has gone to seed. It seems as though certain things are put into the category of “bad,” if they don’t meet our requirements as beautiful. It’s kind of like loss … It’s not what I wanted as a mother, but I have to search for the beauty that is hidden within the darkness. Readers, be supportive by leaving your comments below. After each interview, the mom who was interviewed will be available for questions, and we welcome you to connect with these moms further. Remember, if you would like to be interviewed, just contact me. Click below to see all of my 31 Days Blog Series or click here for yesterday’s post. Oh, Jenny. Your mother-heart shines through everything you do and say beautifully…as does your heart that honors our God. I have walked with you after losing Isaiah, and I’ve read Isaiah’s Story. Your testimony is so powerful. And, these words…well, these words say it all…for all the mothers who walk this path. Thank you Kelly. It isn’t always the easiest thing – emptying ones heart, but I feel that it is time to speak the truth on loss. For those who haven’t experienced the greatest loss that a parent can face, and for those who have said goodbye. I had to travel through my grief at my own pace, and am now “allowing” God to guide me through the journey that has been allowed in my life. For whatever reasons it may be – it is not my job to figure out. It is my job to be obedient to the One who created both Isaiah and myself. I wish that little boy were coming through my front door this afternoon after an exciting day at Kindergarten, but that just wasn’t the plans for Isaiah’s life. I’m choosing to trust God. My best friend gave me the link to this blog today and I’m so glad. I’ve been searching for others who truly understand the pain of such a loss that I can relate to in order to help me cope and heal. My husband and I have been married for two years and recently lost our first child, a beautiful little girl, at 19 weeks gestation on October 2nd due to a complication called incompetent cervix. Among many other emotions and thoughts, I too dealt with guilt of knowing it was my body that gave out and failed to carry my sweet baby like it should. I struggle with sleep and peace at times, as does my husband…but we both also have a strong faith and know God must have a bigger plan. We try to focus on that and each other as we cope through this and heal from it in our own ways. I’m grateful for resources such as this that I can turn to for added support. Thank you for sharing your story. I am so glad that your best friend gave you the link to Angela’s blog today. In the beginning days, weeks and months after my loss, I was in constant search to find other woman who understood the depth of grief that consumed my heart and soul. It is so hard to feel as though your body failed your child. Try to cling daily to your faith in God. He will make beauty from your ashes. Thank you so much for your support, to me personally and to the numerous women out there that may be struggling and healing who have found and will found support through your words. That takes a strong faith and so much bravery as well as a strong and healing heart. Your reflecting a strong faith and bravery as well Makayla. You have taken some of the first few steps in healing. You are sharing your story … your daughter … your pain … and your faith. These are all big steps to healing. I’m glad that you reached out today. God Bless you.